This past Monday night was the largest event of the season at our little island home. A huge regatta sails through our area each year, hosting nightly parties on many different islands. They tend to be a wild bunch – professional partiers who can carouse until the wee hours of the morning and still get themselves back up again to sail on to their next bash. It is truly remarkable – they no doubt spend their year building up their alcohol tolerance in preparation! This is the first year that our toucans are here for the festivities and while they are always game for a good time, we knew this party would be WAY out of their league. Paco, Paz, & Pepe live outdoors in our upstairs tropical garden, which is generally a tranquil place. Our island is roughly one acre in size – now picture that and add 300+ party people dressed as rockstars (the theme) and a band playing until nearly daybreak. Needless to say, when your normal bedtime is 6pm, lights, music, and loud celebrating going on until 2am is not really your scene. So it was decided that the toucans would spend the night inside our enclosure and we’d have a little slumber party of our own. In case of an emergency, we have large dog travel crates for each of the toucans should we need to move them out of their cages. We chose the largest of the dog crates available (the ones made for the giant breeds such as Mastiffs, etc.) and installed two perches inside, one slightly higher than the other in the back. The toucans like to hop and move around, so our goal was to ensure that in the event that they had to spend any extended time in the carriers (for us, that would be during a hurricane) that it wasn’t too small or confining. But as much as we try to create a space of comfort and safety, the birds still see the carriers in a much different, less appealing light. I can certainly understand it from their perspective. Probably every time in their lives that they have been in carriers, their world has been completely uprooted and they have been moved to a new, unknown world full of new people. Who knows if all of these changes were pleasant ones. Because they seem to enjoy their life here with us, I imagine the thought of leaving must be an unpleasant one and a valid concern. Unfortunately, I have not yet been able to fully desensitize them to their carriers in our trainings, so for now, the carriers were certainly a negative experience for them. To make the transition a bit easier, once the birds were safely in their carriers, we put them outside on our porch (in the shade) until the sun began to set. I have recently discovered that while trying to acclimate Paz to spending time in our house that the indoors is extremely frightening to them. There is a good chance that they have never been inside for much time at all in their lives. So keeping them outdoors certainly seemed to help the progression towards the night under our roof. They all did pretty well considering the circumstances. Paco and Paz were mostly calm, sitting stoically for awhile and even played with some toys briefly. None of them ate very much, but I was able to get them to take a few of their favorite treats, which was a nice relief for me. By the time Paco and Paz started to get stir-crazy, it was nearly bedtime, so we were able to move them in and provide darkness to create some calm. Pepe, my little toy monster, was the only one to really handle things in stride. He can generally be a bit on the jumpy side and he didn’t appreciate being put in his carrier, but once inside, he mellowed out fast. One of Pepe’s most endearing qualities is his undying love for his toys. Anything of interesting texture that can be held in his beak and between his toes is sure to keep him occupied for long periods of time. I wasn’t sure if he was going to be too nervous in his carrier to play but once I saw that he was calm, I gave him a new squishy tube and he was focused and happily purring away for hours. They rustled a bit throughout the night, as we could still hear the loud party going on outside. But overall, I think they were able to sleep a bit and we moved them outside at first light in the morning, when they normally wake. They seemed a little disorientated when they woke up, as if foggily trying to remember how they wound up here (the old Pretty Woman syndrome). But once back in their own space, they sprung to life and seemed almost gleeful to be home at last. I was relieved to see that they were able to shake off the past day so quickly. I find it admirable how animals live so fully in the present moment. All three seemed voraciously hungry, much like I am after periods of intense stress. After breakfast, they treated themselves to thorough baths, as if to wipe themselves clean and start afresh. I am also delighted to see that the grudge they are bearing towards me is minimal. I can understand the slight feelings of betrayal that they are surely experiencing, but I have made my apologies and we are moving forward in continuing to build on our trusting, loving relationship. 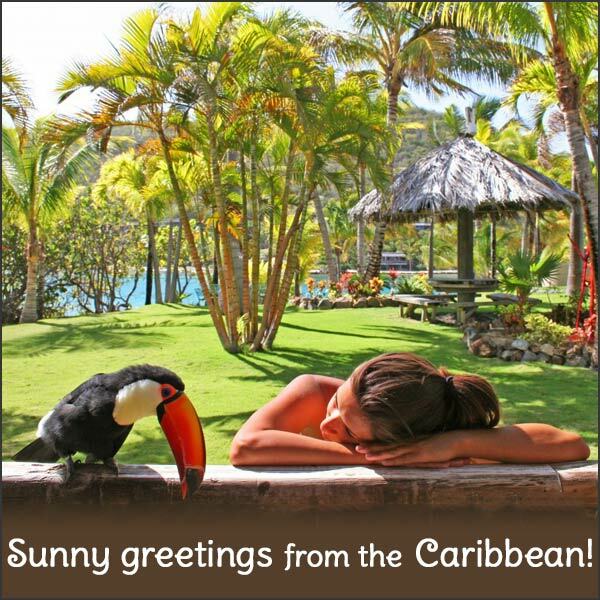 This entry was posted in Care and tagged bird, bird carriers, birds, Caribbean, emergency preparation for birds, exotic birds, exotic pets, island, party, pet, pet bird, pets, regatta, Toco, Toco Toucan, Toucan, toucan carriers, toucans, travel carriers, tropical birds by Toucan Lady. Bookmark the permalink.